Dubai: The 2014 Arabian Travel Market (ATM), the annual travel trade gathering that opens its doors on Monday, will further showcase the achievements and tourism offerings in Dubai, which gears up to attract 25 million visitors during the World Expo in 2020. 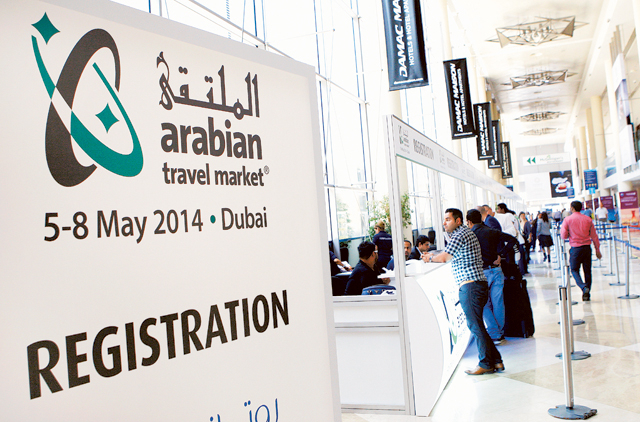 Now in its 21st year, ATM 2014 is expected to see a double-digit growth in visitor numbers and surpass the previous editions, with about 21,000 trade visitors and 2,700 exhibitors expected to attend. It covers about 25,000 square metres of exhibition space, including one extra hall, an 8 per cent increase over 2013, making it the largest international tourism and hospitality event to be held in the region. “In terms of visitor numbers, we’re expecting a double-digit increase. Last year, we had a 20 per cent increase compared to 2012,” Mark Walsh, portfolio director, Reed Travel Exhibitions, told Gulf News on Saturday. ATM provides an important platform for people in the hospitality, travel and tourism industries in the UAE, region and across the world. This year’s show, which will host 120 new exhibitors, will see 83 countries represented and showcase 68 national pavilions, which include those of Argentina, Caribbean, Georgia, Germany, Austria, Ireland, Switzerland, among many others. The visitors expected are from 157 countries. At least 115 hosted buyers from the luxury, cruise, medical and leisure sectors have also confirmed. Speaking at a press conference, Shaikh Majid Al Mualla, divisional senior vice president, commercial operations centre, at Emirates Airline, said this year’s ATM is significant because it is the first tourism gathering since Dubai won the hosting rights for the World Expo. “ATM visitors will see an abundance of new hotel properties since last year, fresh infrastructure and additional attractions as we prepare to reach 20 million visitors by 2020 and 25 million unique visitors during the period of the Expo itself,” he said. According to the data collated by the World Travel and Tourism Council, more than 1 billion visitor arrivals were recorded globally in 2013, contributing 9 per cent of the world’s gross domestic product (GDP). “Dubai is very much part of that picture,” said Al Mualla. Ali Abu Monassar, chairman, The Vision Destination Management, noted that there has been a surge in developments in Dubai’s real estate that can be showcased at the ATM and further strengthen the emirate as a major destination. “For the first time, more than 45 per cent of the projects of real estate developers are related to hospitality. This is the first time ever in Dubai,” he said.